This homemade instant oatmeal recipe makes convenient packets that are lower in sugar, carbs, and sodium than store-bought oatmeal, but higher in protein and fibre! A quick and easy way to make healthier choices on the go! If life were perfect you’d always have time for breakfast. You’d always pack a well-balanced, nourishing lunch. But life happens and sometimes you sleep in. I get it. That’s why my goal is to give you easy ideas for eating healthier. Are instant oatmeal packets the absolute healthiest food on the planet? 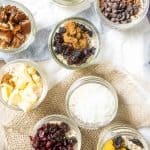 No… but this homemade instant oatmeal is healthier than the boxed stuff and certainly healthier than whatever you might find in the vending machine! These packets are a great snack to keep as a backup at work. Sometimes my husband is late for work and flies out of the house without eating a lunch. His dietitian (that’s me) is happy knowing that he has my healthy, homemade instant oatmeal sitting in his desk, rather than a high-sugar snack. This also works on days when you’re just feeling hungrier than usual. Instead of visiting the vending machine, watch your homemade instant oatmeal packet come to the rescue! If you followed my tips for packing a lunch strategically, then you started small but planned for those times when you have a larger appetite. At that point, making this oatmeal is as easy as the vending machine too. You only need hot water! No cooking or microwave required! do you eat a gluten free diet? This recipe is a great cost savings idea for those on a gluten free diet. I did a quick search online and the only gf instant oatmeal I could find came in little cups at a gouging $2-3 for each serving! Meanwhile, this whole recipe, which makes 12 servings, probably costs less than $5 TOTAL! That’s a savings of about $55 for a measly 10 minutes of your time. So unless you typically make more than $330/hour, the prep for this recipe is most definitely worth your time! Let’s take a closer look at the pre-packaged stuff: 28% of the weight is from added sugar! That actually translates to 30% of the calories! Yikes! 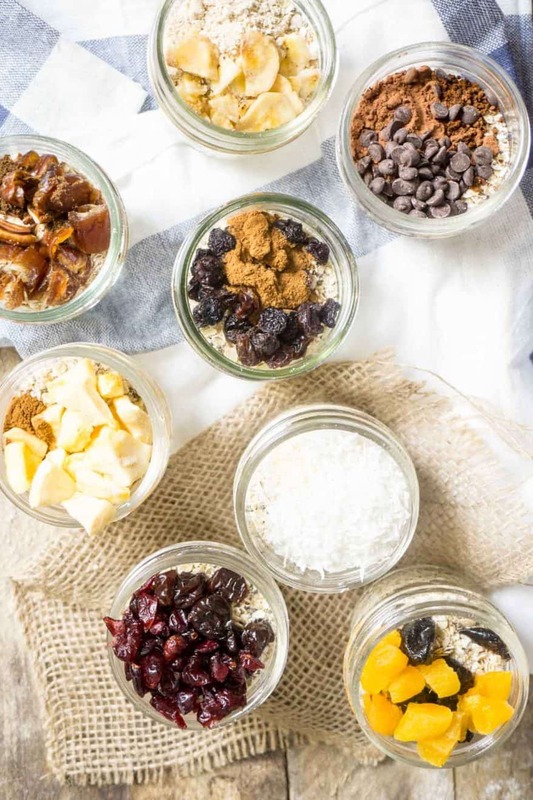 The World Health Organization recommends to keep your added sugars between 5-10% of calories, which means pre-packaged oatmeal is going to need to replace your brownie for the day. I recommend aiming to keep your core foods low in sugar, so that you can still enjoy some actual desserts. Not only does the instant skim milk powder in this recipe add some creaminess to the oats, it also adds protein! If you want to bump up the protein even more, try swapping the skim milk powder for whey protein isolate. You’ll add about 4g of protein per packet. I don’t eat enough fish, so one reason I like to make homemade instant oatmeal is that I use chia and flax seeds, which add essential omega 3 fatty acids. They’re important for brain, nerve, and heart health. For the vanity in you, they’re also needed for healthy skin, hair, and nails! 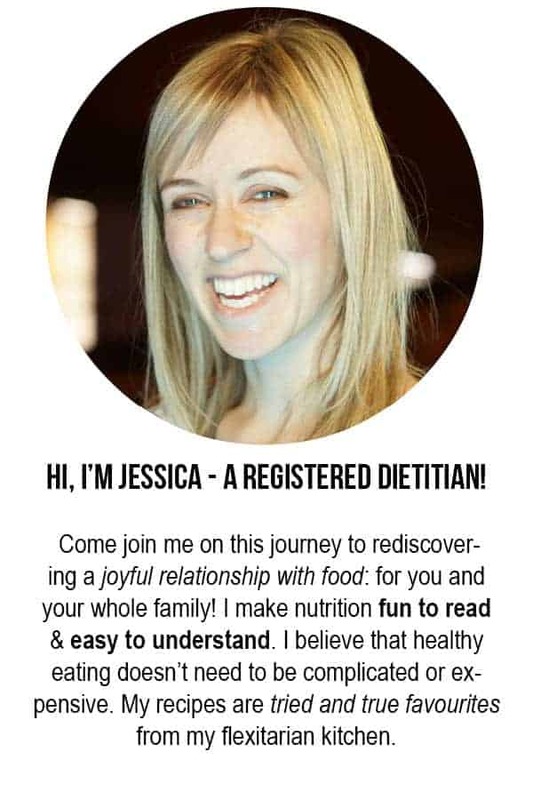 If you found this helpful and want more DO-ABLE, relatable ideas for eating healthier, then subscribe to my newsletter! My newsletter peeps are always the first to find out about new posts and are the recipients of exclusive offers not found anywhere else! Take one cup of the oats and pulse in a food processor or blender until the flakes are broken up. You’ll have a mixture of powder and flake pieces. Stir together the rest of the master mix. Scoop out 1/3 cup into 12 containers that have a 1 cup capacity. Think mason jar, Tupperware, etc. Alternatively, use plastic zip bags and dump into a bowl when it’s time to eat. Add in your favourite mix-ins! See notes for ideas. When you want to enjoy some oatmeal, boil water and add 1/3 cup water to each serving. Stir and allow to sit for 15-30 seconds before eating. We love this idea! We sort of did this when we went on vacation once. We made our oatmeal ahead of time, so we just had to add the water at the hotel and microwave. I always have cocoa in mine. Kevin and Claire are more plain about theirs. However, you’ve given some great ideas here for add-ins that I’m sure we’ll try. I like the idea of the flax seed as a standard to the base recipe. Do the packets need to be refrigerated because of the flax? I’ll need to leave out the skim milk powder or whey protein powder because of the lactose intolerance. Can I just omit that without affecting the end result? The packets will be fine at room temperature for a week or so. Without the skim milk powder, the oats will be less “creamy” but if you’re used to eating oats by just adding water then that will be fine!